You may be thinking of starting a new Company or converting your existing Private Company (Pty Ltd) into a Public Company (Ltd) but not sure of the differences and what's involved. For most of us, we know the pros and cons associated with Public and Private education or health insurance but when it comes to a Company, it's a little more involved. This BLOG is to provide you with a basic understanding of the differences and disclosure requirements. Lets start by saying nearly 99% of registered companies are Proprietary's (Pty Ltd). So why would you consider the odd one out, being a Public Company. 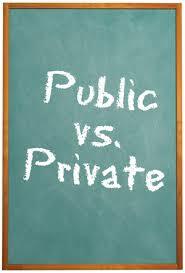 Public Companies, in short need to be more upfront, open and responsible then the average Pty Ltd business. Public Companies are normally established when equity is raised from a number of passive investors (Not directly involved in the day to day operation of the business). These passive investors require a investor friendly environment to ensure that their funds are being correctly managed and accounted for. The same applies for larger organisations registered as a "Not-For-Profits" or Charity group with the "Australian Charities and Not-for-profits Commission" (ACNC). Sponsors and partners will want to know they are linked with an organisation that will not be problematic or put their organisation at risk. Above Board! Public Companies can also be listed on a stock exchange such as Australian Securities Exchange or ASX where-by company shares can be traded in an open market. Must have at least one member and up to a maximum of 50 nonemployee shareholders. By definition UNLISTED, as they are not allowed to raise capital that would require lodging a prospectus or offer information statement. Can hold shares in listed companies. Can offer shares to existing shareholders of the company or employees of the company or a subsidiary of the company. - Unlimited with share capital. - Can be any size; some are very large. - Compliance requirements less stringent than for public companies. Sub-classified as small or large. - Consolidated gross asset value < $12.5m - fewer than 50 f/t employees. - Revenue, assets and employees greater than small companies. Proprietary companies must have at least one director and need not have a company secretary ASIC The majority of registered companies are proprietary. Around 99% of all registered companies are Private. Minimum of one member, but there is no maximum. Can be LISTED or UNLISTED. The use of ‘Ltd’ does not distinguish between them. Can own Pty Ltd companies. Public Unlisted and Listed Companies can raise capital by offering a prospectus and reporting to ASIC. - Limited by shares, eg commercial businesses. - Limited by guarantee e.g. charities, not-for-profits, clubs. - Limited by both shares and guarantee, eg private schools, friendly societies. - Unlimited, eg professional practices. - APRA, if an authorised deposittaking institution, life insurance or general insurance company. - APRA, if an authorised deposit taking institution, life insurance or general insurance company. Around 1% of registered companies are Public. Not required to be audited or file financial statements or a directors’ report. directors’ report for a financial year (and direct them to be audited) and send them to all shareholders. Reporting to members. No requirement to report to members. Required to provide reports to members four months after the end of the company’s financial year. Required to provide reports to members 21 days prior to the AGM or four months after the end of the company’s financial year, whichever is earlier. Required to lodge accounts with ASIC three months after the end of the company’s financial year. Holding an AGM. No obligation to hold an AGM unless the constitution requires it. No obligation to hold an AGM unless the constitution requires it. Must hold an AGM once a year no later than five months after the end of the company’s financial year. Must hold an AGM once a year no later than five months after the end of the company’s financial year. A minimum of 28 days’ notice of the AGM must be provided. Disclosure of constitution. No requirement to lodge a copy of the constitution. No requirement to lodge a copy of the constitution. Required to lodge a copy of the special resolution adopting, modifying or repealing its constitution, and if adopted, a copy of the constitution, and if modified, a copy of that modification. Required to lodge a copy of the special resolution adopting, modifying or repealing its constitution, and if adopted, a copy of the constitution, and if modified, a copy of that modification. Directors voting on matters where there is a personal material interest being considered at a director’s meeting. Can Vote. Can Vote. Must not be present while the matter is being considered at the meeting or vote on the matter, unless the other directors are satisfied that the interest should not disqualify the director from voting. Must not be present while the matter is being considered at the meeting or vote on the matter, unless the other directors are satisfied that the interest should not disqualify the director from voting. Removal of directors. Cannot be removed by other directors but are subject to removal by the members. Cannot be removed by other directors but are subject to removal by the members. Liability of directors for insolvent trading. Face personal liability if the company should carry on trading while insolvent if they cannot establish adequate defences. Face personal liability if the company should carry on trading while insolvent if they cannot establish adequate defences. Face personal liability if the company should carry on trading while insolvent if they cannot establish adequate defences. Face personal liability if the company should carry on trading while insolvent if they cannot establish adequate defences. Directors to notify market operator of interests. Required to notify their interest in the securities of the company of which they are a director and any changes to those interests. Questions to the Auditor. Members are entitled to submit questions to the auditor prior to the AGM and the auditor is obliged to attend or be represented at the AGM. If you need assistance in establishing or selecting the correct Company structure, the Adelaide hills Business Centre (AHBC) is here to assist or contact an accountant or lawyer that have a sound corporate background and understand. For the AHBC simply contact us and make a time to call in or make time on the phone.